The 4 Guid. . .
Mystery has always surrounded the Great Sphinx, a marvel of Egypt. This giant statue is about 4500 years old. Some attribute it to the Atlantean age. It is carved from a single piece of limestone situated on the Giza plateau near the Great Pyramids,(to the west of present-day Cairo) on the west bank of the river Nile facing the Sun. It is about 240 feet long and 66 feet high. It has a lion’s body and a human head adorned with a royal headdress. 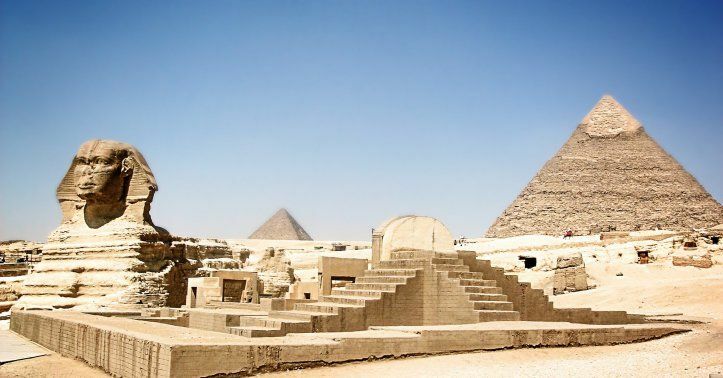 Scholars have speculated about its age, purpose, construction, concealed chambers, role and relationship to the pyramids. Pyramid has a place on one of the tarot cards - The Wheel of Fortune. It sits regally above the wheel witnessing its movement to illustrate the concept of living in the world but not being of the world. It is one of The Goddess oracle cards too. Here, it stands for challenge. Are we ready to face the challenges of life? It holds the keys to the wisdom gates. On the path of deep knowing, initiates had to confront the challenge that the Sphinx posed. These four principles form a program of personal improvement and spiritual development. The spiritual journey is one of knowledge...and that knowledge is never-ending. If we are "to know," then we must constantly be learning, questioning, and expanding our horizons. “Know thyself” is an ancient Greek aphorism. This phrase is mainly attributed to Socrates. According to him, an unexamined life is not worth living. It can simply be translated as know your limits, know your motivation or simply know yourself. No religion has ever taken the quest for self-knowledge as seriously as Hinduism. At its core, Hinduism is not about believing what somebody else tells you about the nature of your soul, or accepting what others claim about God. Hinduism is about exploring the very depths of your own soul. Learn. Read. Several teachers who have gone before us have shown us the way. Study and practice spiritual technologies that are available. Meditate. We also gain knowledge through our own experiences. This can be interpreted as having the courage to grow. We need to step out of our comfort zone. We should face the unknown, courageously moving into experiences that are far outside what we are used to. You should be ready to confront all the beasties that lurk in the dark reaches of your unconscious. Be ready to release fixations on safety, predictability, and objectivity. It means to have determination and perseverance. Nothing of any value comes with ease, and spiritual growth is no exception. We need to study and work at it. If we make the choice to evolve and grow spiritually, then we will be able to do so. We have to make that choice. Our will guides us and can lead us to success. Without it, we are stagnant. No matter how talented we are, we still have to hone the skills of single-pointed concentration and visualization. We have to overcome the tendency of the mind to wander to mundane things, and of all your conscious and unconscious desires to distract and deceive you. You have to have the will to do your practice even when you don't really feel like it or when other obligations are clamoring for your time. "Keeping silent" means that we need to make sure we never gossip about others. We need to learn the value of inner silence. Sometimes the unspoken is more important than the words we utter. We need to keep our practices private. Mature people don't talk about their abilities unless someone asks. We need to resist the temptation to chatter. Talking too much will scatter the energy of our working or diminish our enthusiasm. To keep silent is to be patient. The patience to wait and see...to not be anxious for results...but to trust that our efforts will bear fruit. We need to accept that our abilities will develop slowly, in pace with our growing maturity and wisdom.